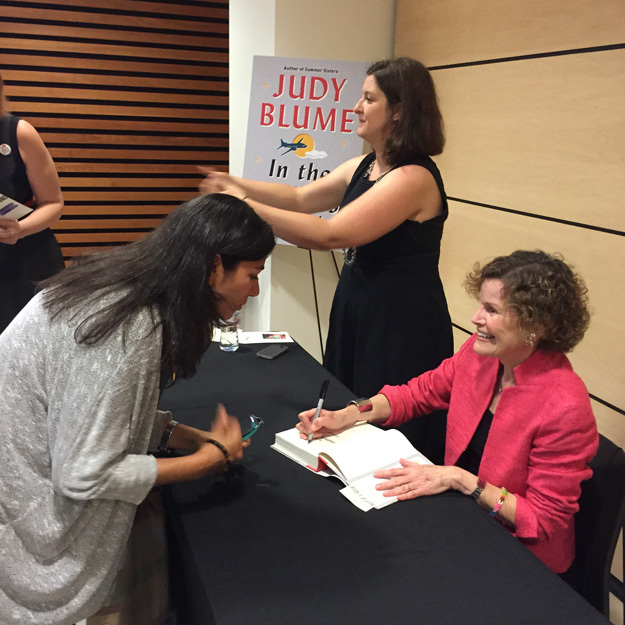 A couple of months ago, I abruptly ended my post about the 40th anniversary of Forever when I found out Judy Blume was coming to Toronto. I wanted more details and I NEEDED tickets. 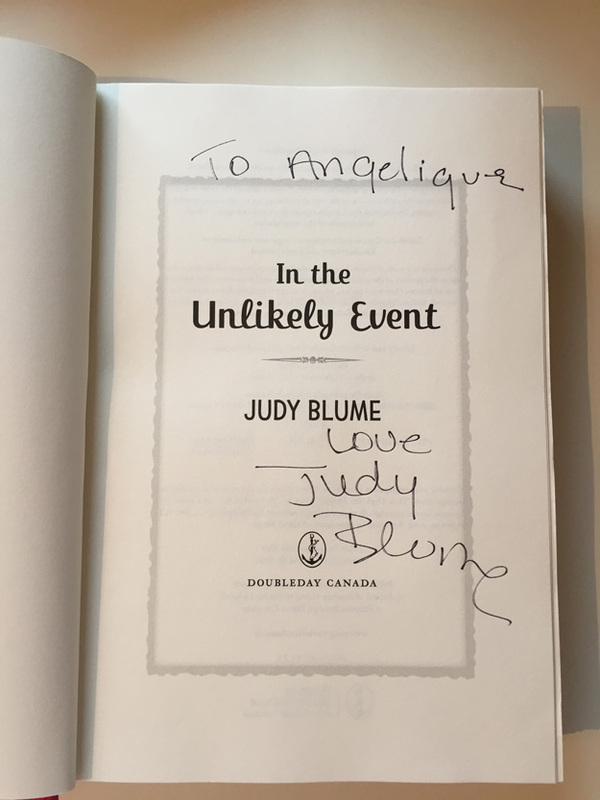 The Toronto Public Library was hosting the event to promote Judy’s first adult novel in 15 years, In the Unlikely Event. 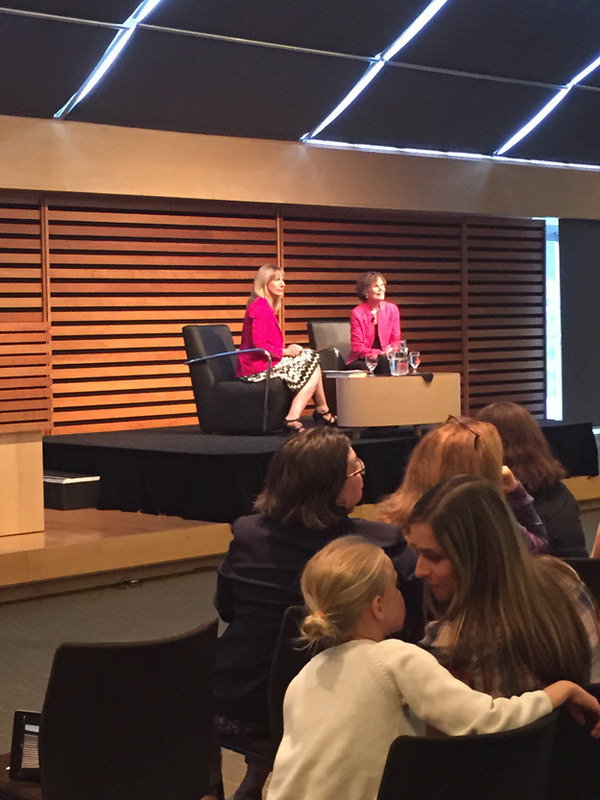 Judy – she of purple-cover Are You There God It’s Me Margaret – was going to be the Toronto Reference Library! I HAD to be at this reading. I put reminders in my calendars and weeks later when the day came I went online and my tix were confirmed at 9am sharp. I think by 9:10 it was sold out. But I had two glorious tickets and couldn’t wait! I would get my copy of Are You There God, It’s Me Margaret SIGNED!!!! I checked my book shelf at home and found 3 old Blume books, but not Margaret. 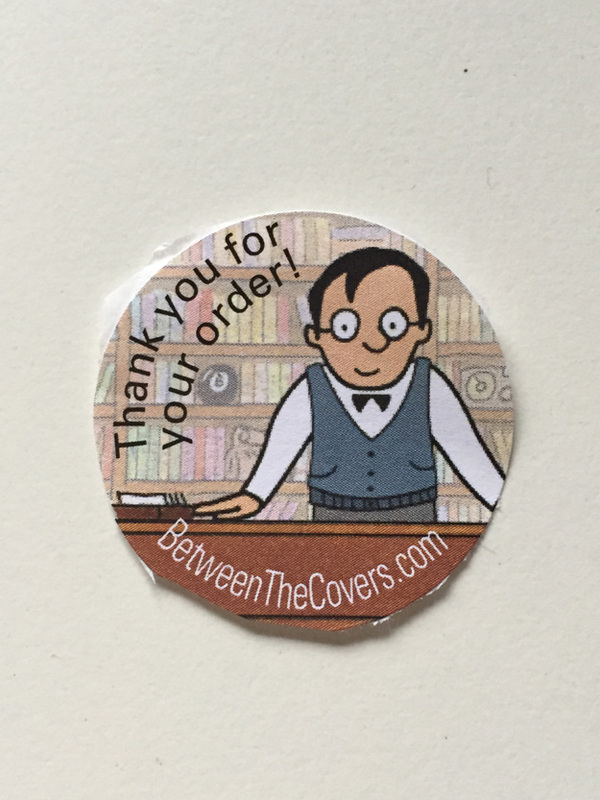 Then it hit me – I lent it out to someone years ago and now it was gone. Plan B: I’ll just buy an old copy and bring that to the reading. Starting with Pandemonium and a couple other used book stores in the Junction I came away empty handed, except for the reminder to check out abebooks.com, a terrific aggregate used book store. And thanks to the good folks at betweenthecovers.com I had a purple cover back on my shelf, ready for Judy. 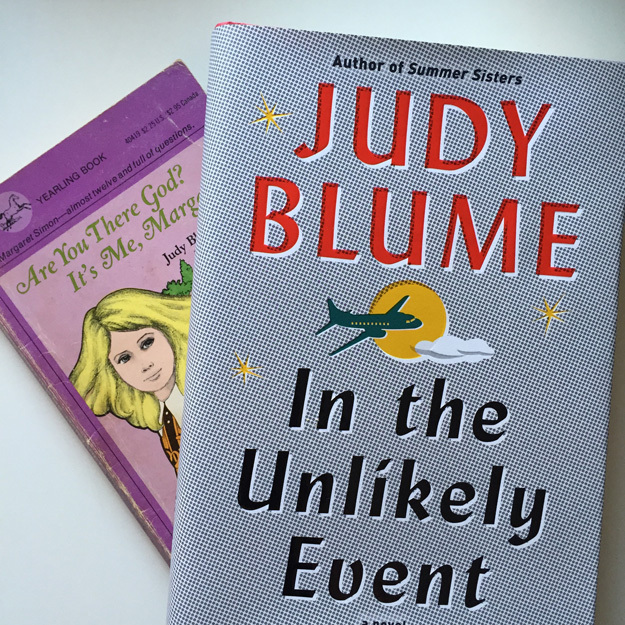 Before the event, TPL emailed all ticket holders:: “Please note: Judy Blume will only be able to sign one copy of In The Unlikely Event per person. 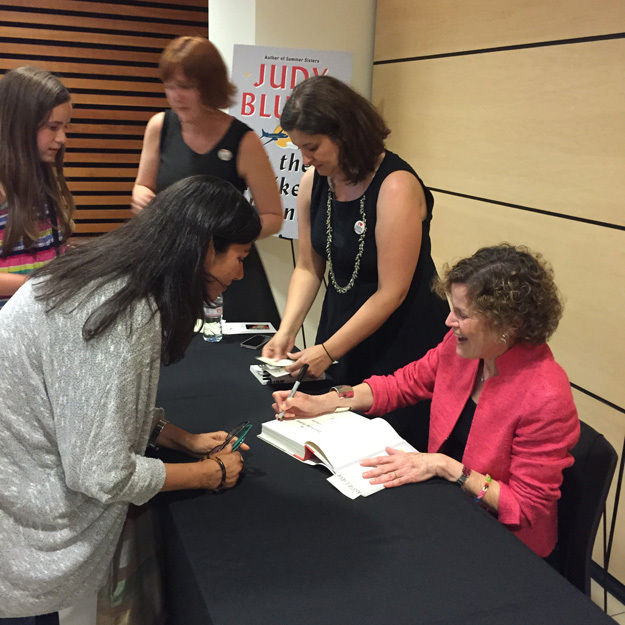 Because of audience size and time constraints, Judy will not be able to sign any of her other books.” Sad face. 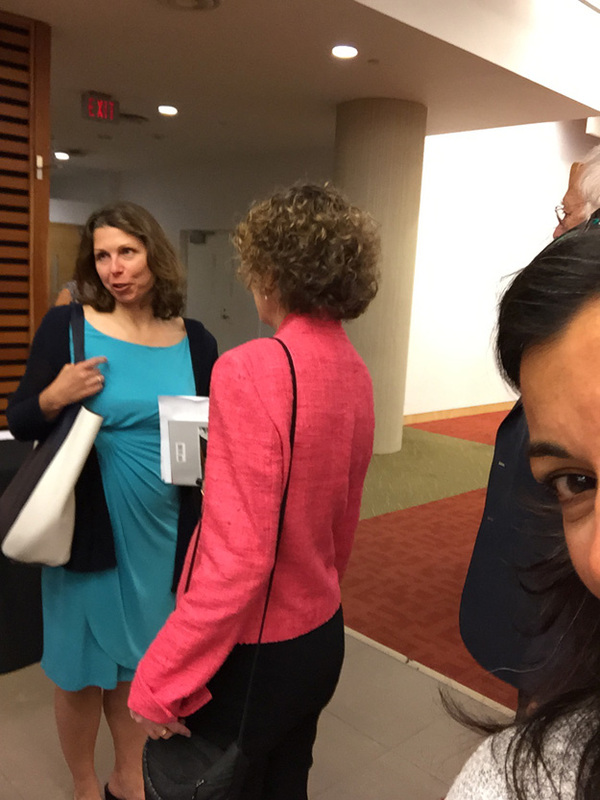 But I turned that frown upside on June 29 – the night of the BIG EVENT. I arrived at the library before 5pm and there was already a line up. As I waited for my friend, I was surrounded by the chatter of hundreds of 12 year old girls disguised as 20, 30, 40, 50 year olds. Still waiting for my friend at the front of the line, suddenly there she was and pretty in pink! How can this woman be 77 years old?? I’ve got your back, Judy! 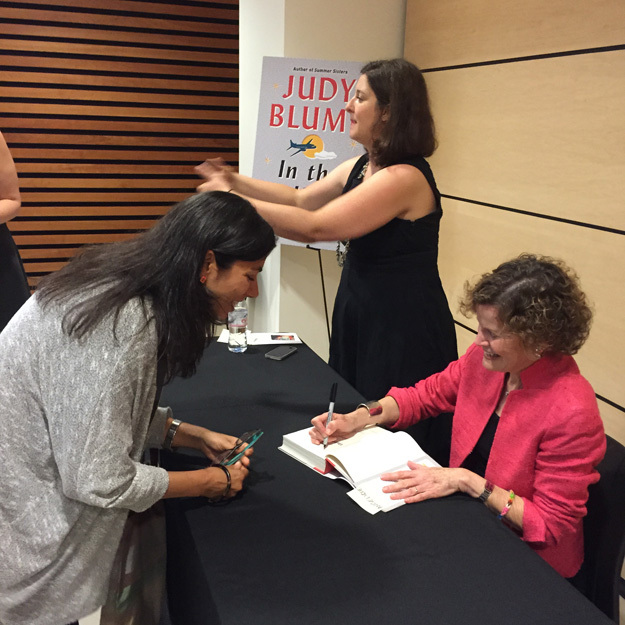 Rachel Giese was the woman we wanted to be as she interviewed Judy Blume and she did a terrific job. Judy was such an absolute delight to listen to. Her stories were interesting, her answers insightful. I loved how she kept reaching out and touching Rachel’s arm like they were old friends catching up. She was so genuine, warm, funny and real. I don’t know why I’m surprised by this. I could listen to her recite a recipe and know that there will be wonderful twists and tangents that will go beyond what’s on paper. And then there was George. George Cooper, a non-fiction author and Judy’s husband of nearly 30 years. Their love and partnership was clearly evident as he helped fill in the blanks in her stories, and stood to wave the crowd of his wife’s adoring fans. George chatted and even signed books as we waited for our moment with his wife. The staff from Penguin Random House were super organized in ensuring the line moved fast and not a moment was wasted or lost. Here’s me and Judy! “HiJudyit’ssoamazingtomeetyou!” Yes I spoke that fast. No matter what your topic, I always find myself smiling when I read your blogs. 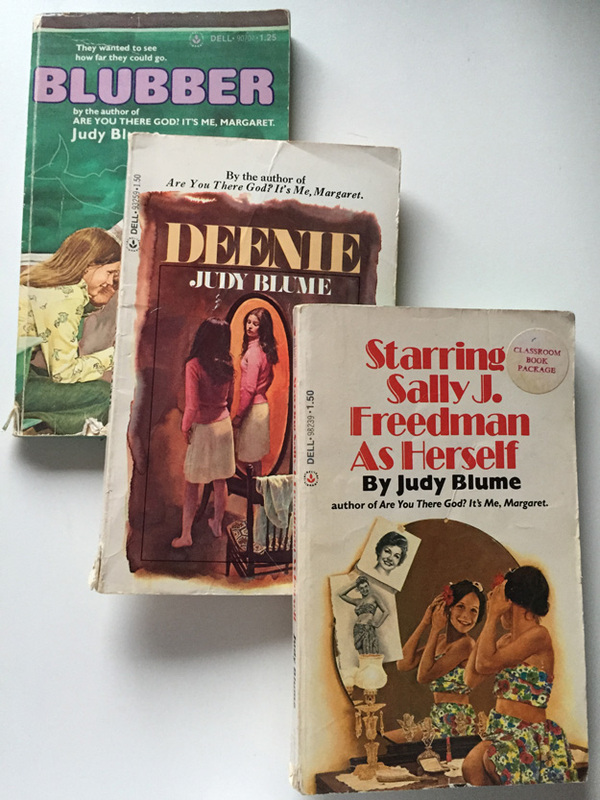 Growing up in England, I was never exposed to Judy Blume but was an avid reader. I’m going to visit the library, become 12 again and read them just to understand your excitement.